What’s behind the new surge could determine whether it’s a fluke or a full-on Bitcoin bull market. We think it’s the latter. Since April 1, Bitcoin has jumped over 20% – a remarkable run for a coin that’s dropped as much as 517% since its December 2017 peak of $19,650. The Bitcoin price hovered in the $3,000-range for a good three months to start 2019, but now, it’s headed skyward. Here’s what’s driving the sudden Bitcoin resurgence… and a catalyst on the horizon that could turn the whole market bullish on Bitcoin. Last week’s jump was one of several made by Bitcoin in April. The rapid trading on BitMEX created a discrepancy between the Bitcoin price listed on different exchanges – BitMEX’s Bitcoin market price was higher than on rival exchanges. 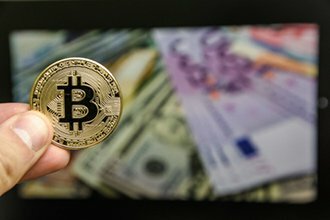 At the same time, over $500 million was funneled into Bitcoin short positions as some investors bet the cryptocurrency’s price would fall once again. Another theory for Bitcoin’s April price jump was that a large Bitcoin investor noticed the increase in short positions and decided to smoke out the short sellers with a massive investment. In a recent interview with Decrypt, George McDonaugh, the founder and CEO of KR1, a blockchain investment firm, suggested that the large position of short sellers could be responsible for the coin’s recent run-up. “There’s always a myriad of possible reasons why Bitcoin has had a surge in price,” he said. No matter the reason, it’s clear Bitcoin has been on a run over the last month. And it isn’t the only cryptocurrency to run up in that time, either. Ethereum, the world’s second largest cryptocurrency by market cap, has jumped over 16% in the wake of Bitcoin’s surge. Cryptocurrency legend Michael Robinson just revealed the little-known details regarding the future of Bitcoin… and why at any moment, it could be poised for a record-breaking rebound far beyond anything we’ve witnessed already. Michael made a prediction about Bitcoin way back in 2013 – and folks who followed his advice stood to become 253 times richer. I’d venture to say not one in 10,000 people are aware of the massive profit potential unfolding right now.